One Lifetime = 2,366,820,000 seconds. How do you measure your day? For the most part, TIME on a general scale, is something we take much for granted. I know I certainly did when I was young. Procrastination comes as natural as breathing. If we squander so much time by nature, how are we then supposed to capture the moment? Time is a precious resource, one of the most precious of all I would say. We can replenish our money, we can recover our health, but time is something you can never get back. Once you’ve lost it, it’s gone and the issue is that we take the next second for granted. We consider our every breathe to be a replenishment of the previous one, when in fact, it is not! Each breathe we take is a separate life of itself. Each one containing countless options, possibilities and decisions of which only one can emerge. A close friend of mine asked me if I thought time stood still with a lover. “When you kiss or make love, it feels like times stops” she said. I believe the reason behind that feeling is because we are living consciously and attentively in the present moment. That kiss or that act of love is all we focus on. When you are in the present moment, there is no wandering of the mind to the past or the present. None of that exists. All you have is now. So it would make sense to feel as if time was frozen. It is a beautiful thing to be in the present moment, we should all strive to live there more often. 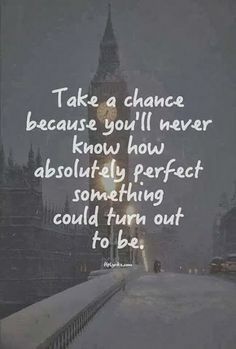 Another beautiful think is to take chances, seize opportunities, take risks. Life is a set of moments, all you need is one to change your entire life. If it doesn’t work out, at least you tried. Whatever you do, seize those 86,400 seconds over and over again! Previous i m a g i n e.
Every moment is unique and special. I thought this was a great reminder. Do you think this compares to what Buddhist call “mindfulness”? “Mindfulness” of the moment? Also, what do you think of the “readiness of the moment”. The video shows the consequences of not taking action or making decisions. It’s a risk, but I wonder if there’s such a thing as “the readiness of the moment”, is one ever really ready? Or do people mature at different intervals, and the readiness comes when recognising this “self awareness” and be willing to face the consequences that entail the risk? The moment cannot be ready or unready. The moment just is. You, on the other hand, can think you are unready. But that is just your mind being confused. I think that people who take more risks than others doesn’t necessarily mean that they’re more ready, it just means they are more experienced/aware//hopeful to the Universe and the present moment, to life changing in an instant in order to react to it. Just because you don’t feel ready doesn’t mean you aren’t. “I think that people who take more risks than others doesn’t necessarily mean that they’re more ready, it just means they are more experienced/aware//hopeful to the Universe and the present moment, to life changing in an instant in order to react to it. Just because you don’t feel ready doesn’t mean you aren’t.”-Bravo! That is exactly what I was referring to; I guess it’s because I’ve grown conservative with age. The “experience” factor sometimes warns me too often: “beware, you’ve seen this before, you’ll get in trouble”. I like to think that it’s wisdom, yet it can also be the fear of change and openness to life. I am going through my early 50’s, and believe me; it’s been difficult to “trust” that moment again. Age, experience or wisdom can all guide you back to your “comfort zone”. It’s not a bad place to be, it just means that all your decisions are based on a series of strategic factors like… familiarity, proximity or comparisons to previous experiences for example, but we all know where the magic happens… just outside of that comfort zone 🙂 Age is just a number! Yes, that’s exactly what I’ve been alluding to: the age factor. I know age is a just a number; yet the older I’ve become the more conservative I feel. I meditate, and listen to Audio Dharma also. I don’t know if this “age” issue I have is that I feel I’ve become more selective with the experiences I choose to have? So in this sense I believe I’m being mindful, yet this “mindfulness” can also become a cocoon. Thanks so much for this blog and for your reply, and I’ve subscribed to it on my RSS feed.